Carmarthenshire Fungi: Today at the National Botanic Gardens. Today at the National Botanic Gardens. Did the usual Tuesday walk with the wildlife volunteers at the Botanic Gardens at Llanarthne. The most interesting finds were around a large, previously-felled beech tree near the waterfall at the end of Llyn Canol. Apart from being surrounded by Scarlet Elf cups and Turkey Tail, the beech log was also covered with a Ganoderma sp, probably Southern Bracket (g. australe) and Brittle Cinder fungus (Kretzschmaria deusta). One group of these Ganoderma brackets was in a different place and looked a lot thinner than the other, so on a future visit will try and collect some spores to have a look at, as perhaps one may be a different Ganoderma sp. Brittle Cinder fungus (Kretzschmaria deusta). "Fruit body forming irregular wavy cushions or encrusting the substrate, greyish white in the early stages soon becoming brittle enough to crush between the fingers, finally black and very brittle resembling charred wood." Managed to get a photo of some spores by powdering a small piece of fungus, and these also seemed to fit the bill, being smooth, very large (~32 x 8um), with a germination cleft. 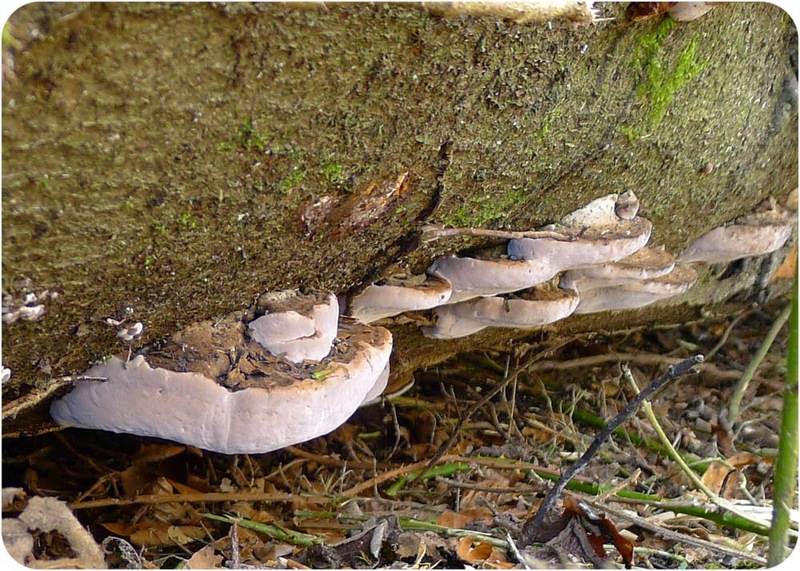 Kretzschmaria deusta, is a seriously worrying tree pathogen, of great concern to foresters. 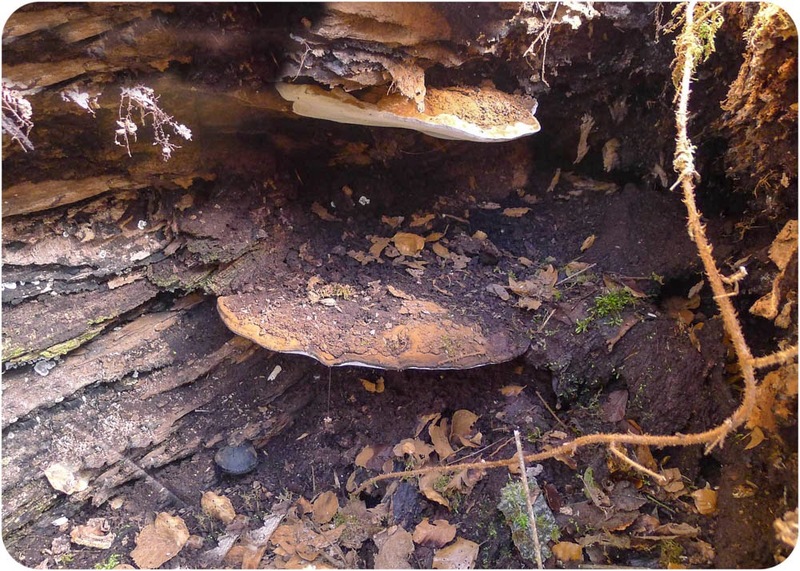 This ascomycete causes soft rot by consuming both cellulose and lignin. Fascinating Colin and well spotted. 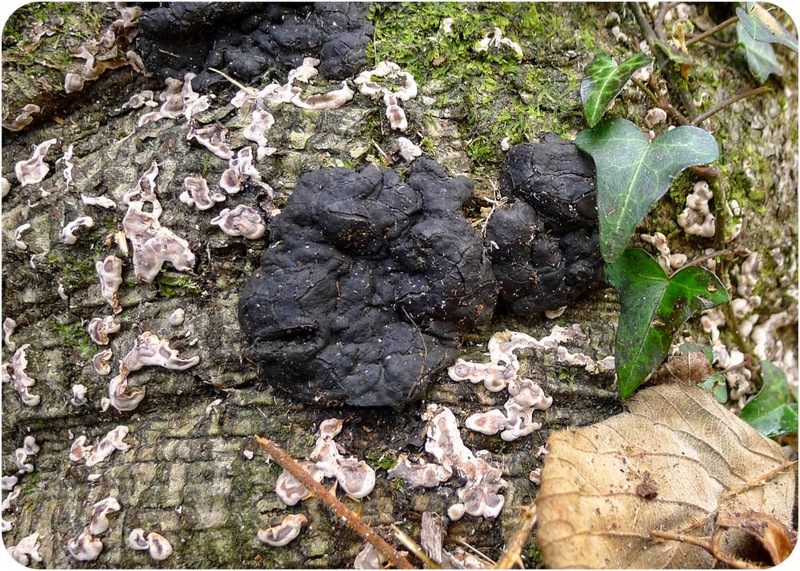 I can't remember if its the same nasty fungus, but a black canker like fungus was found on one small part of the trunk of a mature sweet chestnut next to a bridge in Pont Felin Gat 3 years ago. The tree looked healthy to me but the tree inspector said it would have to come down as the fungus showed its days were numbered and, being next toa path, could be dangerous. Could also be the reason that this large beech was felled, as it also looked fairly robust.